Jo and Kirsty are from the UK, and they both wanted a mountain wedding, and where else to get that epic backdrop? No other than beautiful British Columbia! 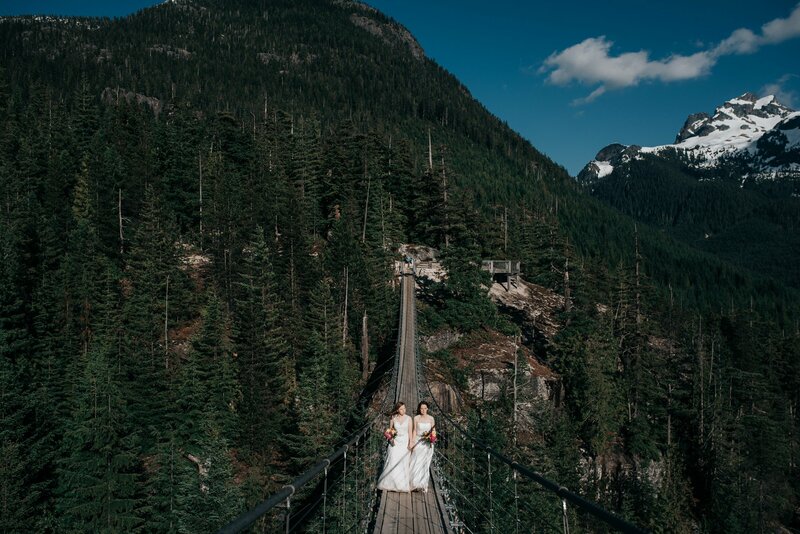 They chose Sea to Sky Gondola, a popular wedding venue in Squamish that sits on top of a mountain overlooking a landscape of mountains and beautiful turquoise ocean water. Their guests got to enjoy a nice gondola ride up, and enjoyed the the outdoor ceremony that took place on The Spirit Viewing Platform. We took portrait photos of these beautiful brides at the top of Sea to Sky Gondola as well, since there really is no reason to leave that view. They were both so relaxed and went with the flow with every photo we thought up. It’s a pretty epic location for photos. After they enjoyed a lunch wedding reception in the Summit Lodge. There was axe throwing on the mountain that day, so the entire wedding went outside and competed in an axe throwing competition, which is definitely a first for us (I kinda wish I threw an axe). Jo and Kirsty were amazing and so much fun to work with, along with their family and friends who all but two of them flew in from the UK to spend the day with them. Jo and Kirsty, we wish you a lifetime of happiness with lots of crazy, fun adventures. Thank you again for choosing us to photograph your beautiful intimate wedding, yet a big event in your lives.